Eucalyptus albens, the White Box, will developinto a medium to tall tree. The trunk is short and straight. The crown is rounded to spreading. Bark is persistent, light grey to whitish with bleached patches. Branches are smooth and white. Leaves are oval to lance-like and are grey to bluish-green on both surfaces. The buds are carried in clusters of three to seven and are spindle-shaped (see thumbnail). In our cold climate garden flowering occurs in late winter and spring. Large, creamy-white flowers are profuse and conspicuous. At this time large honeyeaters and Rainbow Lorikeets fill the trees with strident bird song. Barrel-shaped gum nuts follow the flowers. 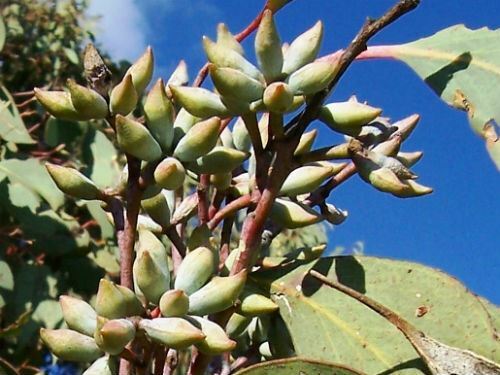 Eucalyptus albens is found from southern Queensland through the western slopes and tablelands of New South Wales to Victoria. There is also an isolated population in South Australia. As far as we can tell the White Box does not extend further east than our cold climate garden on the Northern Tablelands of NSW. 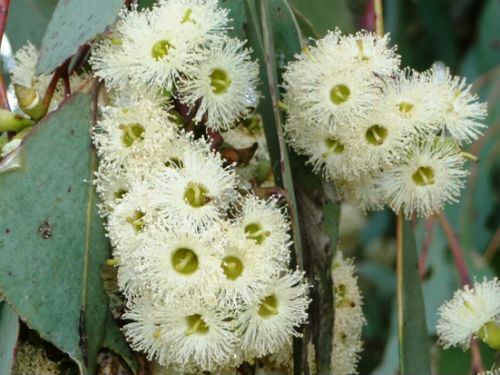 The species is one of seven eucalypts that occur naturally on our Yallaroo property. Eucalyptus albens is too large and overpowering for the average suburban garden but would be an ideal for rural properties.